This course will teach you how to gain your audience and how to keep them. You will learn how to maintain a strong connection with your audience through attractive and engaging treatments of stories with human interest. You will be placed in realistic UK newsroom situations, so that you are in the position of making those crucial decisions on which stories to cover and how to treat them. This will ensure that your audience is always on the increase. 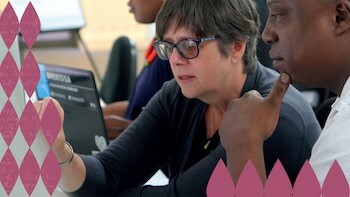 Your course Instructor is Deborah Kelly, who has more than 30 years experience as a senior journalist and manager working for UK and international media organisations, including the BBC, Al Jazeera, ITV and Thomson Reuters. Deborah, who's a Fellow of the UK Higher Education Academy, will guide you through the best ways of understanding and analysing your audience, making sure your content is engaging and relevant to them. - NEIL THOMPSON is Editor of one of Britain's top TV news and magazine shows, Good Morning Britain (GMB) which is live for two and a half hours every weekday morning. He has held senior management roles at ITV, including Controller of News and Commissioning Editor. - OWEN MASTERS is Assistant Editor at GMB, leading a team of producers, reporters and presenters. He makes the initial decisions about the content of the programme. - GMB Assistant Editor BEN BRISCOE leads the overnight team. He'll brief the presenters, allocate resources to breaking stories and run the show from the gallery. - CAROLINE SIGLEY is GMB's News Editor. She leads a team of producers, researchers and reporters who investigate stories that may be of interest to the viewers. - FRED MWASA completes the expert line-up. He's deputy editor-in-chief of Kigali Today Limited, which has a radio service, and websites in English and in the Rwandan language. Fred has a massive following on Twitter in Rwanda. - Section 1 provides an overview and introduces the course instructor and our media experts. - Section 2 explains the significance of understanding your audience. Once you understand them, you can engage with them and adapt your content to make it relevant to them. - Section 3 demonstrates how news stories can be chosen according to the characteristics of your audience. Once you've learned how young they are; how educated; whether they have jobs; their gender balance etc., you can cover stories in a way which will attract and keep them. - Section 4 discusses how to engage your audience through story treatment. There are many different ways of covering a story, e.g. case studies, interviews with experts, live coverage etc. Above all, content should be humanised - because news is essentially about people. The audience will relate to your story if it includes people whose lives have been affected. - Section 5 is the course summary.